Parrot U | America loves Sporks! While out and about, I stumbled on this store called Parrot U. 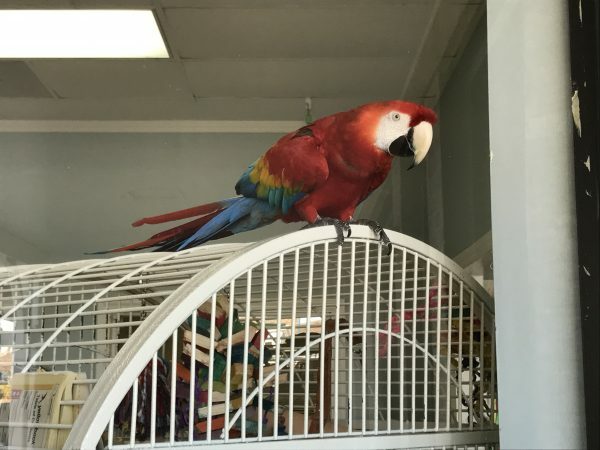 The store is pretty much what you would think it is – it is a store that teaches parrots. So when I walked up to the window, a set of beady eyes looked back at me. I seem to have a parrot that would love to be adopted. Does anyone have experience with owning a parrot? I like the idea that I don’t have to go outside to walk the parrot and pick up his or her poop. Hey, that is my cousin Sam ! They live a long time. You have to make sure you have a ‘will’ stipulating who takes care of them while your on leave to the afterlife. Its a good idea Fred. My wife says I talk to much. Does your wife feed you crackers? What kind of parrot? That’s a Macaw in the 2nd photo… those can live 40-70 years. Do you have any allergies? Certain types tend to produce more feather dander (fine dust)… not too bad if you allow them a way to preen regularly (misting with water, wet parsley, etc). They can screech in the morning, part of their daybreak/sunrise ritual. What I like about parrots is they eat seeds and nuts, so -no- need for soft or live food. If you’re home most of the time a single bird will do fine, and will easily bond with you. Otherwise, if the bird will be alone most of the day/week, it will do better in groups of 2+ . Amazons, African Greys, and similar parrots are fine. I would avoid Lovebirds or other ‘pairing’ birds because they can be more ‘antisocial’ to humans. One thing that is very dangerous for parrots is non-stick cookware being heated… it gives off fumes which are poisonous to parrots (and parakeets, etc.) That should probably be reason enough for humans to avoid using Teflon/Silverstone cookware. This is probably a project for in the fall, if we go forward with it. 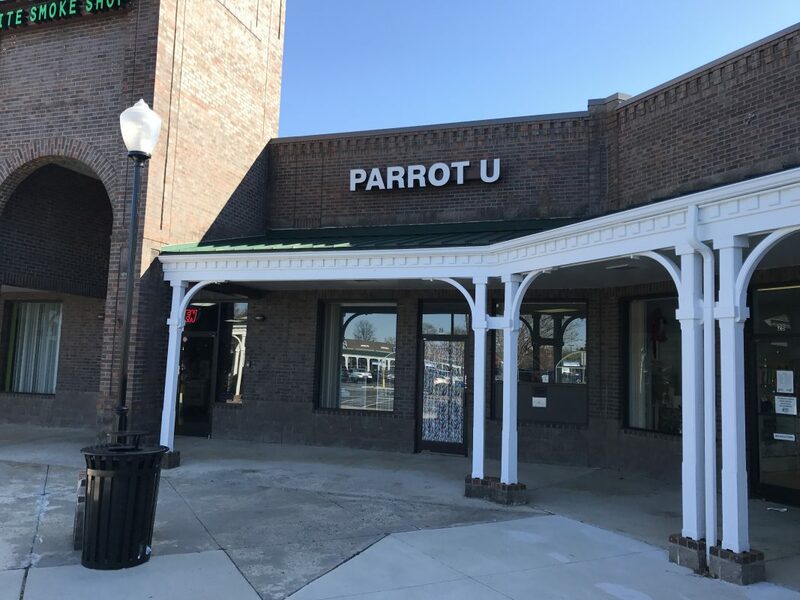 On second thought, Parrot U is probably more about training the humans, not the parrot. They work with a non-profit group that places parrots in crisis, which matches up with the description you have given their long lifespan. When we get old, the parrot group wants the parrot returned to them to rehome it to the next generation of humans. That’s pretty Cool. Good info from the Chairman. I’m glad to see someone doing this for the parrots! More often, the crisis is probably due to neglect, or not understanding that birds/parrots need social interaction and mental stimulation. For example, in the photo of Amber with ‘Bosley’ you’ll notice Bosley’s chest is plucked bare. That’s called feather plucking (i.e. self-mutilation) and it’s usually indicative of a mentally or emotionally distressed bird, obviously at Parrot U for rehab. It’s good to know they require two ‘avian orientation’ classes prior to adopting out a bird. Parrots really are not difficult or expensive to keep (few to zero vet bills) , but they do have some unique and stringent requirements to remain healthy and fun. If you want a parrot that will mimic your electronic devices, hang out with you, and learn lots of vocabulary, I’d suggest an Amazon variety, African Grey, or something of similar size. I’m sure Charlotte, NC has an exotic bird show every spring or summer, that would be a good place to get a feel for the ‘bird community’ and meet a nice variety of parrots and people.